The photos below were sent in by my customers. 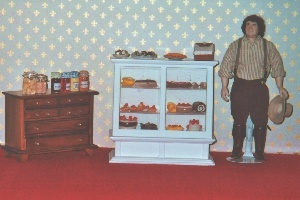 This page features dolls made from my doll kits - dressed by my customers and placed in their room boxes or dollhouses. Click on the photo to see a larger version. If you have a photo you'd like to share, please contact me at: portraitdolls@yahoo.com. I'd love to include your photo. You may also send photos of dolls that were dressed by me that you have living in a room box or dollhouse that you have created. This doll was made by Eleanor in Hawaii using the Paul doll kit: Paul head, natural hands and bare feet. Eleanor created this wonderful beach scene by blowing up a photo of a local beach. 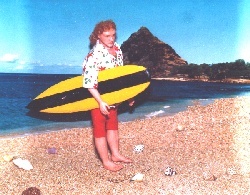 She added sand and shells and dressed Paul for surfing. This doll was made by Nancy in Florida using the Vincent doll kit: Vincent head, natural hands and white oxford shoes. Nancy dressed Vincent in his painting smock. 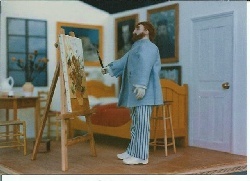 He is hard at work in his bedroom at Arles. This dressed doll was made for Margaret in Florida. He was dressed in a 3 piece suit: Hudson head, natural hands and modern shoes. 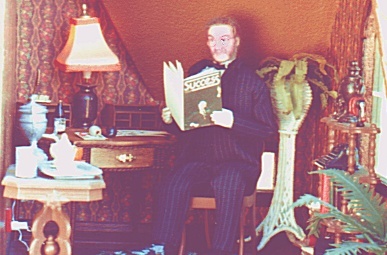 Hudson is seated in a small home office which is one room in a larger dollhouse. This doll was made for Eileen in Scotland using the Patrick doll head. He is dressed to look like Charles Ingells of "Little House on the Prairie". Please ignore the funny way the stripes look in this thumbnail photo and check out the larger version.